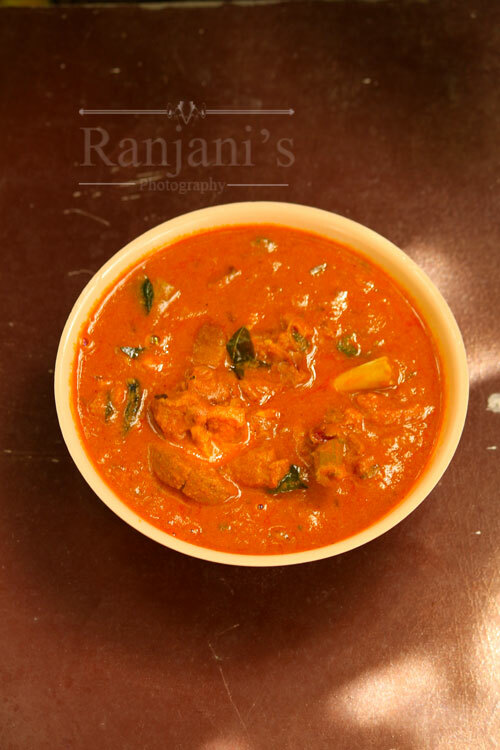 Mutton kulambu recipe / Kari kulambu – here the delicious mutton kuzhambhu recipe made by amma. There is no competent for amma’s nonveg preparation. If it is a restaurant, relatives home or friend’s place, I never get the taste like amma, especially nonveg recipes. Particularly meen kuzhambhu. Me, brother and sister won’t eat fish in restaurants or anywhere. We don’t like the taste anyways. 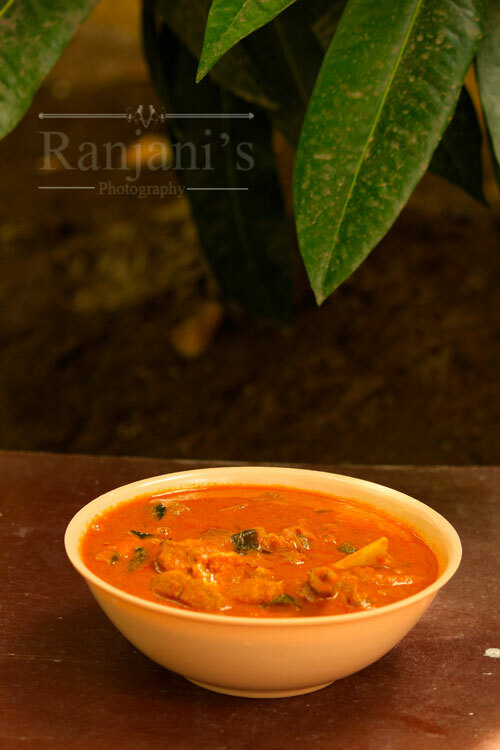 When I asked amma to make mutton kuzhambhu for my blog, she made it as very simple and easy to follow a recipe. And she told me that while we share the recipe with others, it must be simple and made with available ingredients. So here is uncomplicated and very palatable Kari kulambu. Wash mutton pieces well for 2 to 3 times with plain water. Then add tamarind powder, mix well and rinse with water. Completely drain the water and keep aside. Heat a kadai or pressure cooker, add oil, add half portion of chopped onions and ginger garlic paste, saute well till the raw smell goes off. Now add finely chopped tomatoes, cook in low flame till it gets cooked well. Add washed mutton pieces to it and stir in between. It starts to ooze water, now add enough water and salt to cook mutton. Close the lid and pressure cook for 5 to 6 hisses. Keep the flame low and let it cook for 15 mins. 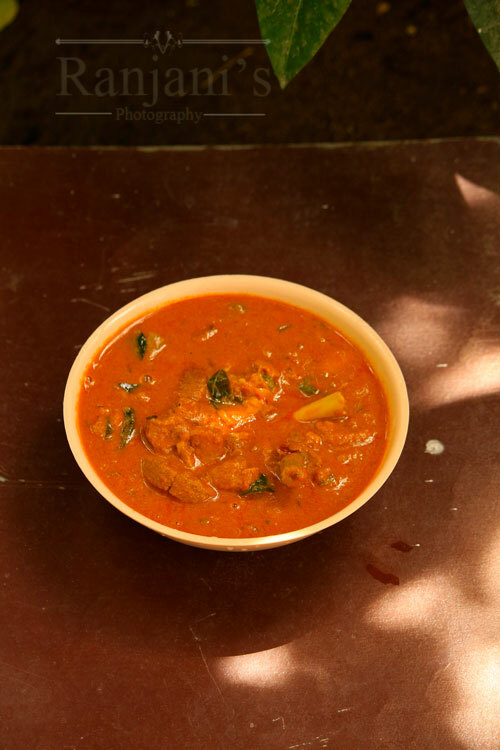 Once the mutton gets cooked well, add kuzhambhu chili powder, grounded coconut paste and mix well. Heat separate kadai, add oil, bay leaf, cloves, cardamom, cinnamon, curry leaves and remaining onions. Saute well and add the kuzhambhu to it. Allow it to boil till the gravy slightly thickens. Turn off the flame, add lemon juice and coriander leaves to it. Serve with steamed plain rice, ghee rice or biryani.